This epic tour of San Diego takes you through the city’s liveliest neighborhoods and showcases its most coveted attractions. 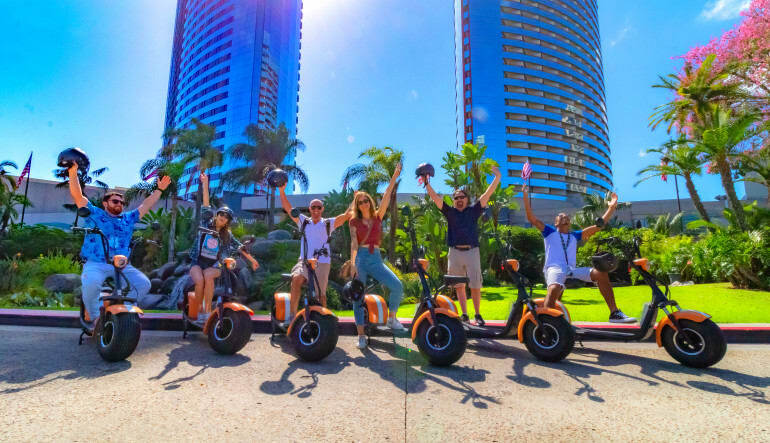 This epic tour of San Diego takes you through the city’s liveliest neighborhoods and showcases its most coveted attractions. 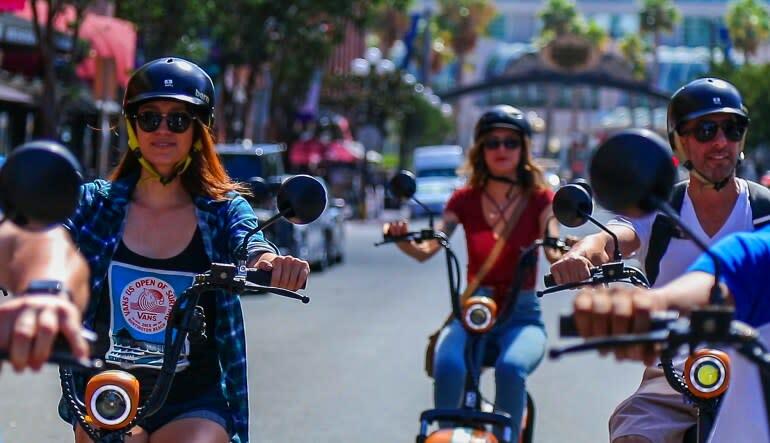 And while the destinations are all certainly impressive, the most celebrated aspect of this guided San Diego tour is, arguably, your mode of transportation: scooter! 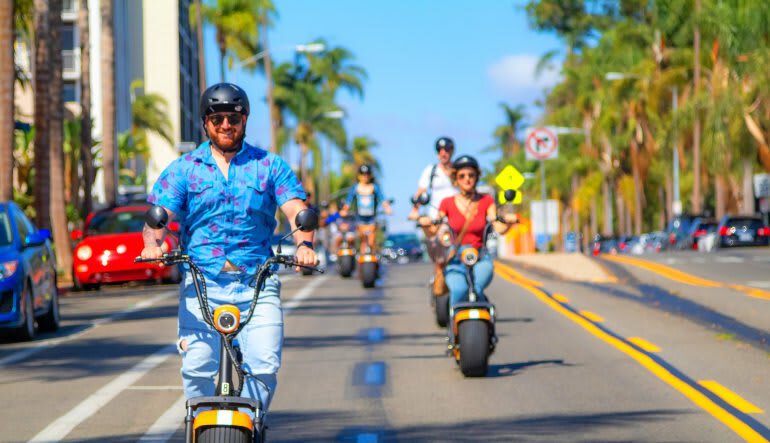 But not just any scooter… this San Diego tour equips you with a Phat Scooter—a modern, fully electric vehicle that features wide tires, making the riding experience effortless! Guided by a GPS that shares fun facts about all the colorful sights, you’ll zoom through Little Italy, see the USS Midway and travel into the Gaslamp Quarter. The experience’s focal point for many is its full tour of Balboa Park, which dazzles with its Spanish Renaissance-inspired architecture, lush gardens and museums. The photo opportunities are near-endless! Begin the adventure with a quick riding instruction. 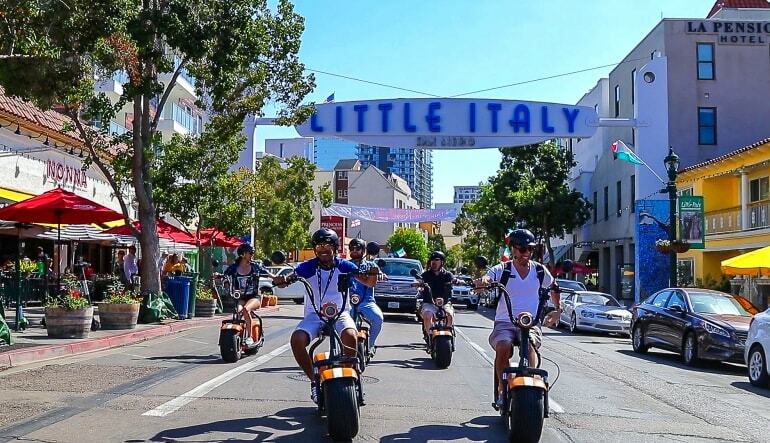 Travel to Little Italy—get acquainted with its delectable eats and thriving arts community! Ride past the Maritime History Museum and USS Midway. Explore the historic Gaslamp Quarter, known for its lively restaurants and bar scene. Take a full tour of Balboa Park! Snap photos of its manicured gardens and outdoor organ pavilion! Head to Hillcrest, home to some of the country’s best restaurants (now’s the time to make dinner plans)! Stay on track with a GPS that shares fun facts about each neighborhood! Because it’s a GPS guided tour, you’re welcome to veer off the path if something catches your eye. It's at the same time a guided tour and an open-ended adventure. Get to know Sand Diego—book this one-of-a-kind tour today!